Authored by Alexander Romanov (a.romanov) on Nov 21 2014, 5:08 PM. "Like" token, awarded by lightbwk. The Vector Transform node is a useful node which is present in the Cycles renderer. This patch implements the Vector Transform node for GLSL mode and the internal renderer. Generally doesn't look bad to me apart from the formatting issues. I would love to avoid adding view matrices to ShadeInput. 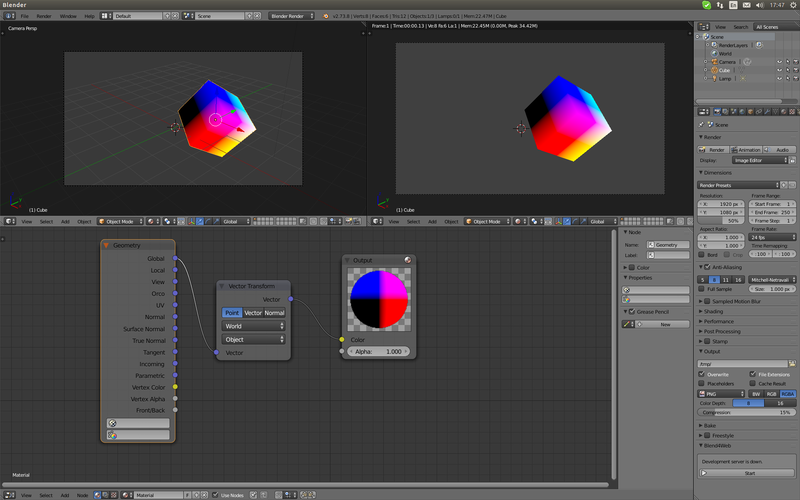 It can be done if you pass Render to ntreeShaderExecTree and copy to ShaderCallData but might cause concurrency issues? @Sergey Sharybin (sergey)? What would you say? vin/vout would be good here as well. Alright, discussed with @Sergey Sharybin (sergey) and we agree that it's better to pass Render to ntreeShaderExecTree and copy to ShaderCallData. That way you can avoid duplicating the matrix in ShadeInput. Adding some more eyes here since Antony is temporary unavailable for the reviews. Will have a closer look a bit later. Alexander Romanov (a.romanov) marked 4 inline comments as done. Updated for the current master. Now it is ready for review. Set the done flag for all comments. There're quite some code style issues in the code which were reported but seems not being addressed. Please read the patch carefully and make code style matching our existing one. Also, an idea. Seems global R is always passed to ntreeShaderExecTree. In this case, can we simply make it RE_render_current_current_get_matrix(int which_matrix) which will get matrix from R? Seems it'll simplify some cases here. Also, is it really needed to get a pointer to matrix instead of having a copy semantic? If the code is only run on shader compile would prefer to have a copy semantic instead of piercing internal pointers to an external world, especially without any const qualifier. Something is wrong here, either it's not done or the patch is not updated. Should be space between keyword and bracket. Picky: Render is kinda more generic, and should go before shi/shr. Picky: Use braces around value. Also emum is better to be defined before the function declaration. Either use copy semantic (copy_m4_m4 to a float result) or use const qualifier here. We don't want those matricies to be modified externally. Alexander Romanov (a.romanov) marked 5 inline comments as done. Alexander Romanov (a.romanov) marked 15 inline comments as done. Here we are updating some stuff in render instances that depends on the flag. if the view was updated, we must update the relevant matrices that depend on it. It is a flag from RE_updateRenderInstances. Specifies what things have changed. Generally looks fine, with some minor feedback. Maybe @Campbell Barton (campbellbarton) would like to have some final glance over this. Please use lowercase for functions in this module. Looks like feedback so far has been addressed, I just went over and noted some real minor issues. Otherwise seems this is ready for master. Name is a bit odd 'current_get_matrix', could just have functions for each of these. We have for eg, RE_GetViewPlane - possible could add RE_GetViewMatrix, RE_GetViewMatrixInv ? realize naming here is messy. You can avoid cast by doing &viewmat, same above. rather annoying since its not modified, but we didnt set the args to const here. safe to cast. If its the current-view then it could be called RE_render_view_get_matrix? I've marked this as accepted, though since this isn't code I maintain, best have @Sergey Sharybin (sergey) / @Antony Riakiotakis (psy-fi) or @Brecht Van Lommel (brecht) do final sign-off before going into master. @Sergey Sharybin (sergey) checked this patch. Since the last review by @Antony Riakiotakis (psy-fi) the code got just minor modifications. So I think that it makes no sense to bother the developers anymore. It use global R that is always one, so it could be used by view or during render with F12. 'arc land --hold' tells me that revision is not accepted. I think there should be no rejection marks. So I will wait for @Sergey Sharybin (sergey).